Mangaluru, 15 May 2015: The Karnataka Department of Food, Civil Supplies and Consumer Affairs started the process for registration of APL and BPL ration card through online application from 15th May 2015 onwards both in rural and urban areas. Those who are left out from the food security scheme advised to visit respective Garma Panchayath office in rural areas and Mangalore one service centre, Atal Janasnehi Kendra of Bio metric centres in urban areas and fill online applications along with required documents. Sources in the office of Commissioner of Department of Food, Civil Supplies and Consumer Affairs, S S Pattanasetty has confirmed that process of online application for new ration cards has began. 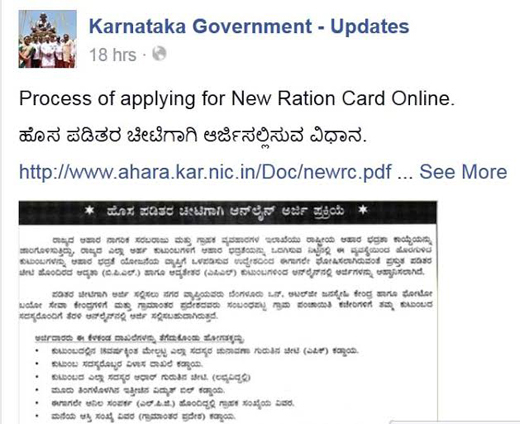 One The facebook page of Karnataka Government publicity wing also posted announcement of online application process for BPL and APL cards in facebook. The new announcement by the department does not mention the process of sending sms to a particular mobile number ahead of filling online application. But, they listed out the documents required to submit to avail a card. In Dakshina Kannada district the department had received 77,670 applications for new ration cards last year and 45,000-odd cards have been distributed. A total 11,000 BPL card applications have not been processed because the applicants have not submitted their EPIC number. The district administration has also faced with piling unclaimed APL/BPL cards by applicants for various reasons; the department of food and civil supplies has warned that the 11,256 unclaimed BPL cards will be cancelled if people do not give their EPIC number. The department will send a report to the government about 4,000-odd unclaimed APL cards. our old ration card no is MNG05108394 dt 15-6-2015. this is not inclusive of other family members as well as aadhar no.now i want to include other family members also the aadhar no in the new ration card to be issued from your end. i want to have the ration card as i am living in our own house for the past nearly 13 years with family. I am staying in Honnakatte, Kulai, Mangalore since 20 years from 1995. But my Voter ID ADDRESS is KONGALLI VILLAGE, GODDU, SAKALESHPUR, HASSAN DISTRICT - 573123 CAN I TAKE THE RATION IN MY CURRENT RESIDENCE I.E., AT KULAI MANGALORE?